Hi! I'm back with another card for the MFT Creative Olympics - this one for the Crafty Biathlon. 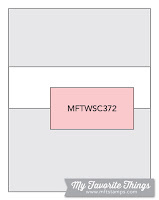 I also used the current MFT sketch. 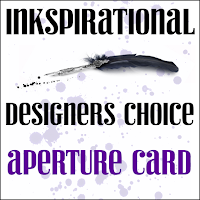 As I made a shaker card, I'm also playing along with Inkspirational who are looking for an aperture card. For the first part of the biathlon, I chose to do some Emboss Resist, using Balloon Strings background stamp and distress inks. I white-embossed the stamp onto both the card base and a card-front sized panel of white cardstock. On both pieces, I masked of the top and bottom before stamping and ink-blending. The bottom piece I masked a bit lower down so that there would be no white areas show through the opening. Once I was finished, I removed the masking tape. I die-cut the stitched dome die from the extra cardstock and the stitched dome frame from a scrap of white cardstock. I put the shaker components together and adhered it to the card front with some sequins in the opening. The little mermaid was colored with Copics and I also stamped some sea foliage to put behind her. Finally, I stamped the sentiment. 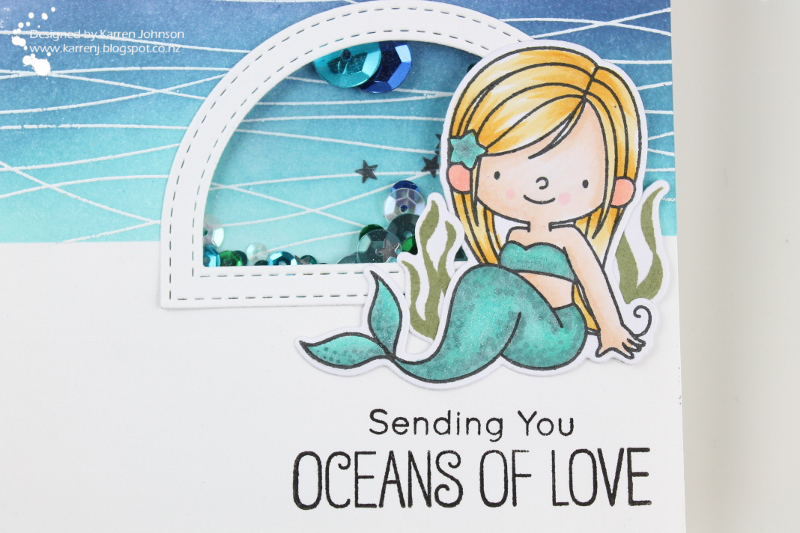 Wow this is cute.....love that ocean-y background! 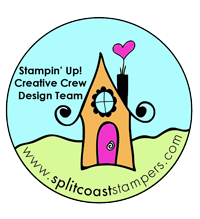 Such a fabulous design, Karren! I love how you used the balloon strings and how you created the shaker component for this card! 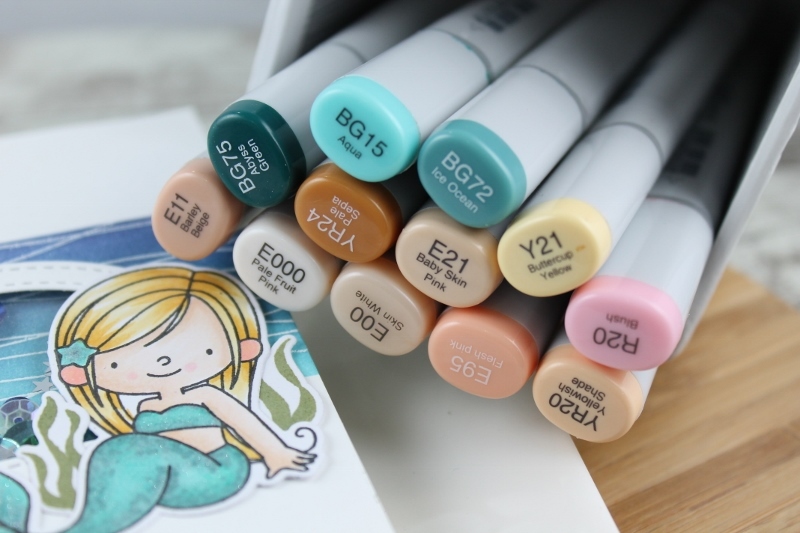 Your mermaid is darling and your Copic coloring is just beautiful, as always! This card just brings a smile to my face, Karren! I love that the shaker is see through! 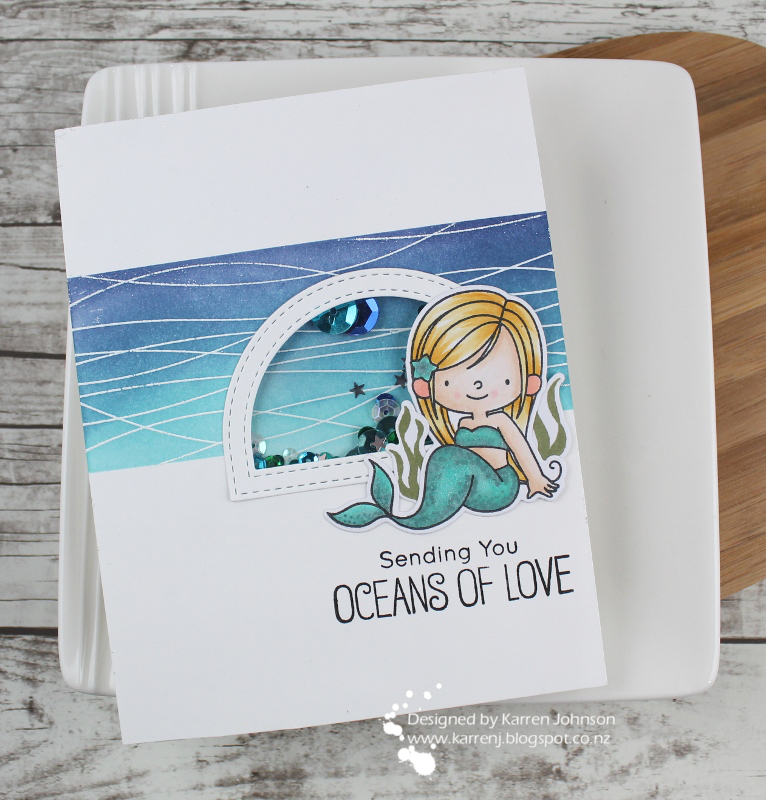 Your mermaid is adorable and I love your texture on her tail! Wow! This is one stunning card! I love all the techniques you used and the color palette looks wonderful. So oceanic! :) Thanks for joining us at Inkspirational!